Sat News has been the receipiant of information regarding companies and organizations assisting with the daunting rescue efforts in Haiti after the catastrophic earthquake. Telecomes San Frontiers (TSF) relay information indicating that their efforts are supported by the European’s Commission Humanitarian Aid Department. At the airport: to the OSOCC center (On-Site Operations Coordination Centre). TSF have established Internet connections and high-speed satellite lines to UNDAC teams (United Nations Disaster Assessment and Coordination) with BGAN terminals and to search and rescue teams (such as USAR UK, USAR Peru, Defensa civil Española, USAR Mexico) as well. 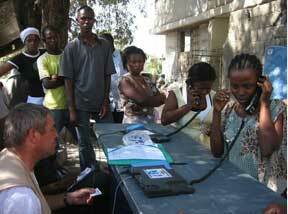 At the Minustah camp (United Nations Stabilization Mission in Haiti). The camp hosts all the United Nations agencies (Unicef, IOM, WFP, OCHA, FAO…) and the NGOs deployed (Acted, Handicap International, Mèdecins Sans Frontières, Croix…). 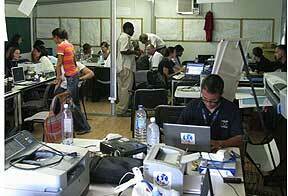 NGOs based in Haiti that have their building destroyed by the earthquake also gather in the Minustah camp. Due to the continuous growth of rescue teams coming to Haiti, TSF teams opened a VSAT to the Minustah coordination centre to provide a connection more important. At the government coordinating office of the DCPJ (the criminal division of the police). The national Haitian police had not had Internet access since the earthquake, until TSF installed a BGAN terminal on January 25th. The role of the police is very important in such crisis since they are in charge of securing the aid distributions. TSF teams have also run assessment in Port-au-Port in two buildings to install the DPC (the civil protection division). Government services could benefit from TSF satellite installations through BGANs and mobile phone, allowing them to resume their activities in this centre which replaces temporarily the President and Prime Minister’s offices that collapsed with the earthquake. Beyond high-speed satellite equipment, TSF are providing a vital ITC support to the whole humanitarian community and go along with their operations, ready to deploy any technical assistance. Thanks to their telecom expertise, TSF teams could install a long-term connexion to UNICEF at the Minustah camp. Those satellite communications are all the more crucial to aid workers since the context is very difficult and unstable. At the same time, since January 16th, affected populations have been benefitting from free calls to their relatives, often considered as hope regained. On a daily basis, TSF offers help in different centers through the affected zone satellite phone services to the populations. TSF teams split every day in three refugees’ camps. Those centers are located around makeshift camps. As a result to date in nine days, up to 2,700 families have benefitted from TSF free calls. The United States, Canada, Europe and the Dominican Republic are the main call destinations. Those calling operations within the affected region receive a very warm welcome since even if the mobile network is back in Port-au- Prince, only one out of five calls are successful. Moreover, in the refugees’ camps, without electricity, people cannot charge their mobile phones. 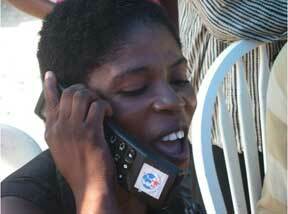 In most of the cases, the TSF free call is their first contact with their loved ones since the disaster. For 10 days, a great part of the population has not been able to reach their relatives. Despair and anxiety are replaced by a huge psychological and emotional as well as a material one relief for the affected populations to ask for financial aid or personalized assistance to their relatives.